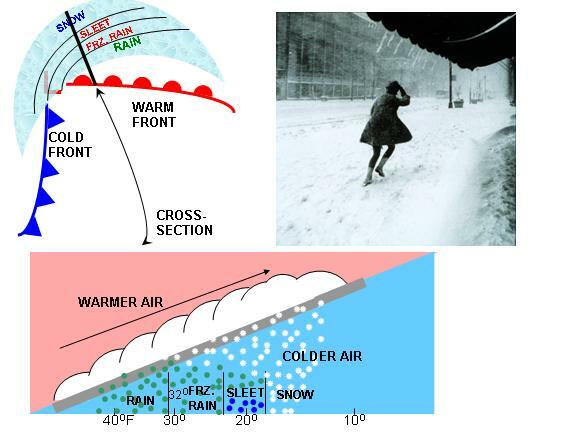 Snow is usually the result of the warm air associated with an extratropical cyclone (low pressure area, as in the diagram above) flowing up and over the cold air surrounding part of the cyclone. The ice particles also grow as some of the water vapor in the surrounding air collects and freezes on them. The falling ice particles in the clouds grow and combine together to become so large (called aggregates) that their fall speed exceeds the upward flowing air speed in the clouds, and they then fall out the bottom of the cloud, reaching the ground if they do not re-evaporate. The more water vapor there is available to the cloud, and the stronger the updrafts that cause this water vapor to condense into cloud water or ice particles, the more likely it is that snow will form within the cloud, and that the snowfall accumulation could be large. So, a cold, cloudy day with no snow indicates that there is either not enough water vapor available to the cloud, or that the rising motion creating the cloud is not enough to cause snow (or both). A heavy snowfall results from abundant water vapor combined with strong and persistent rising motion in the clouds. Snow can also form from very cold air flowing over a large ice-free lake, a situation called lake effect snow. In mountainous regions, air being forced to rise as it flows up and over the mountain can cause large snowfall accumulations. Precipitation caused by this mountain-forced ascent is called orographic precipitation. In regions where this occurs, the downwind side of the mountain often receives little or no snow, since most of the water vapor in the air has already been removed as snow on the upwind side of the mountain.